Richie Venton: STUC CONGRESS: PREPARE WORKERS TO WIN! STUC CONGRESS: PREPARE WORKERS TO WIN! The 122nd annual Congress of the STUC assembles in Dundee as the noise surrounding Brexit drowns out the cries of workers for justice, security and equality. With 39 affiliated trade unions, organising a total of 550,000 union members, the Scottish TUC has the potential to coordinate action around an entirely different vision of society, where the needs of millions in society replace the greed of a few thousand shareholders. But to fulfil that potential requires a determination to take the vast array of progressive policies agreed by Congress delegates out to the workplaces and onto the streets, consciously engaging and mobilising workers in collective action. This is not just a socialist pipedream. 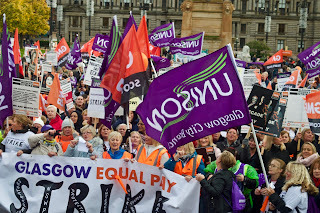 The theme of the STUC Congress is “Organising and Winning", with absolutely justified celebration of the recent victory by Glasgow's Equal Pay strikers. This is a salutary example of how, after years of blockage by the Labour council and hesitancy by some of the unions, followed by foot-dragging by the SNP council, a campaign of conscious involvement of the women workers themselves unleashed an unstoppable force. 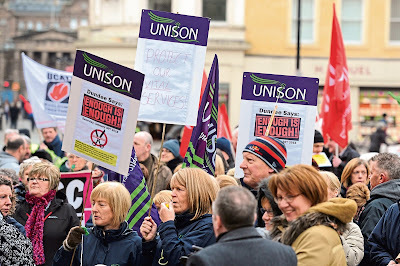 The magnificent 8,000-strong strike last October, and the heroic solidarity action by male cleansing workers, in bold defiance of anti-union legislation, forced the council into action, at a cost of £500million. 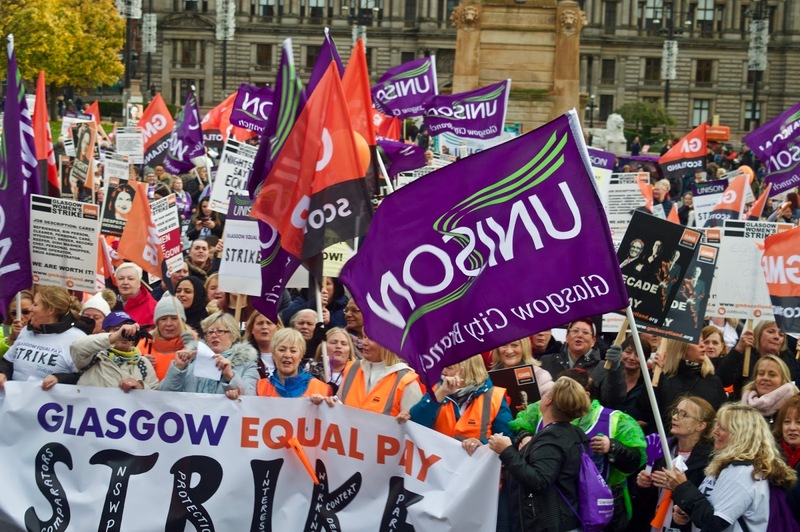 Other recent examples of the potential power of workers taking action, once a bit of leadership is given and members imbued with clear goals and events to mobilise around, include the EIS school teachers’ pay victory, and that of Home Care workers in Dundee city council. Once the EIS had resolved to demand a 10 per cent pay rise, as part-compensation for a 24 per cent loss over 8 years, a systematic plan of school-based meetings empowered EIS members who had reached breaking point with pay cuts, work overload and stunted job prospects. 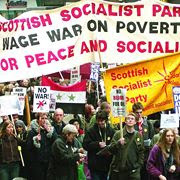 In turn, the mobilisation of up to 30,000 on their national demo both reflected the determination and added to it, laying the foundations for successive rejections of several ‘final’ offers from COSLA and the Scottish government, winning the concession of over 14 per cent over three years, on the eve of an actual strike ballot. More recently, sustained campaigning by the joint unions, and then an overwhelming vote for strike action against the SNP-run Dundee city council, has forced them to abandon plans to impose either split shifts or pay cuts of £4,500 (through reduced hours) on home care staff. Another important victory for workers organising themselves for action. The profoundly simple lessons of these and other struggles need to be applied by the STUC and its affiliates, if we are to avoid the vast variety of progressive policies being passed but then left to gather dust in union offices, or to merely use up digital space on union HQ computers. That applies to issues immediately arising from Brexit, as well as a broad spectrum of issues in our workplaces, communities and entire society. We Won't Pay for Brexit! We are all too familiar with the cynical spin-doctor’s line about it being ‘a good day for bad news’. Brexit has been a good three years for bad news, with the cacophony of squabbles between different wings and factions of the capitalist class and their political parties distracting our attention whilst they slaughter workers’ rights, public services, benefits and jobs. Other Motions rightly demand that exit from the EU and its pro-privatisation regulations should be an opportunity to abolish contract tendering for the likes of Scotland’s ferries, and for permanent public ownership of our railways – as opposed to the Scottish government's continued preference for leasing the service out to the chaotic Abellio. As capitalist profiteering – aided and abetted by the excuse of Brexit – leads to growing job losses and closures, we should support the calls for an industrial strategy that would create jobs and vastly enhance housing, transport, retail and energy. It’s not good enough to rely on Scottish government Task Forces - usually designed to smooth the path of closures and redundancies, as seen at BiFab and Springburn Rail Depot. All experience shows this requires democratic public ownership of the giants currently bestriding the economy; otherwise we will continue to witness private profit ruling and ruining people. Likewise, public ownership of all energy sectors, including renewables - alongside transport, construction and the banks – is the prerequisite for job-creating measures that simultaneously tackle the life-threatening climate chaos. A Just Transition to ‘green jobs' – including through a defence industry diversification plan – is at the heart of what’s required to save both people and planet. Pleading with the profiteers won’t work; nor will praying for peace between rival capitalist powers, who preside over a world wracked by wars and ethnic civil wars. 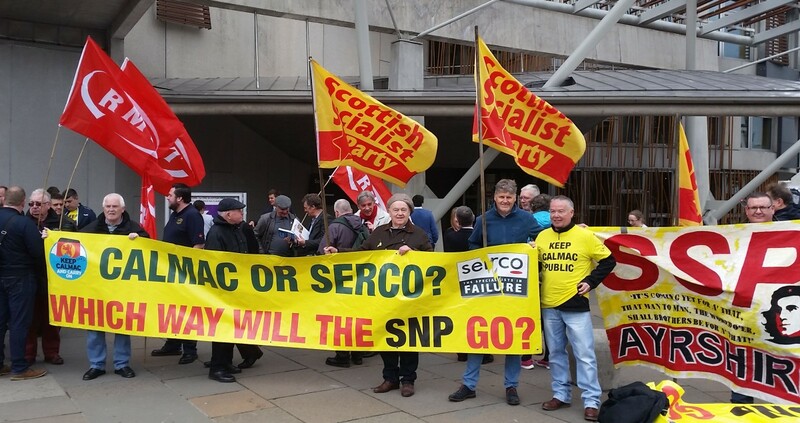 The STUC should enthusiastically support the Motions demanding an end to austerity, reversal of public sector pay cuts, and for the Scottish government and local councils to set No Cuts budgets, spearheading mobilisations of trade unionists and communities to win back some of the billions stolen by successive Westminster governments; butchery in turn passed on by Holyrood. Serious struggles to win collective bargaining rights is equally important to reversing the theft of wages, rights and conditions across all sectors. Sign the Online Petition HERE - TODAY! One of the pivotal policies that the entire trade union movement should unite in action around is being proposed at the STUC by my own union, Usdaw: an immediate minimum wage of £10-an-hour, regardless of age; guaranteed minimum 16-hour contracts for all workers who want them; and the legal right to contract hours based on actual hours worked – abolishing zero hours contracts. In reality, the £10 minimum agreed by the TUC almost 5 years ago is rapidly falling behind a genuine living wage, with at least 14 per cent inflation since, which is why Usdaw (in our forthcoming annual conference document) calls for £10 as the immediate minimum, “rising with either inflation or average wages, whichever is greater”. Alongside calls for more systematic action on equal pay for women workers, these fighting demands could and should be used to engage, motivate and mobilise workers into action. Underlying the wide-ranging policies being debated at STUC is the urgent need for root and branch transformation of the entire system we live under. Every specific demand for action points to the need for democratic public ownership and control of industries and services, if workers are not to remain enslaved by the pursuit of maximum profit by those in power. In one word, it demands socialism. That won’t be gifted to us by the capitalist class, nor by parties married to the mis-named 'free enterprise' economy. It won’t be achieved by resting on our laurels after agreeing transformative policies at STUC Congress. It requires consciously-led mass action around achieving those policies, rooted in an understanding that we are engaged in a struggle between opposing classes. We need to prepare workers at every level for what is at stake. If we fail to prepare, we have to prepare to fail! With a socialist vision of the future, and key fighting policies to mobilise around, pockets of struggle in recent times prove that we can organise to win. The alternative is too horrendous to contemplate, regardless of the details around Brexit. Please comment. Comments are moderated, so be nice. [Some of] MY LIFE AND TIMES AS A SOCIALIST!